Results: The levels of Ki67, LSH, 5-hmC, and E2F1 were all increased in germinal center B-cell lymphomas when compared with those in normal lymph nodes, and LSH was highly expressed in diffuse large B-cell lymphomas (DLBCLs) and Burkitt lymphomas (BLs) that were positive for Epstein-Barr virus (EBV) infection, indicating that LSH is linked to EBV infection in DLBCL and BL. Interestingly, LSH was mainly localized in the germinal centers of lymph nodes whereas 5-hmC staining localized to areas surrounding the germinal centers. Conclusions: These findings indicate a critical role for LSH as a biomarker and therapeutic target in follicular germinal center B-cell lymphoma. The function of cytosine methylation in mature B-cell gene expression patterning implies a contribution of epigenetic instability during lymphomagenesis; however, other mechanisms of demethylation likely exist in GC B-cells. The chromatin remodeling factor lymphoid-specific helicase (LSH) is critical for modulating DNA methylation levels and patterns. Very little is known regarding the mechanisms of LSH in GC B-cells and related malignancies. A potential binding site of transcription factor E2F1 exists in the promoter of LSH, as determined using the UCSC genome browser. Most B-cell lymphomas originate from the follicular germinal centers of B-cells, where memory B-cells and plasma cells producing high-affinity antibodies are generated during T-cell-dependent immune responses., Lymphomas are malignant neoplasms composed of lymphoid cells in various developmental and differentiation stages and lineages., Lymphomas are heterogeneous compared to their postulated normal counterparts. Epigenetic modifications, including chromatin remodeling and DNA methylation such as non-CpG methylation, have been implicated in the formation and differentiation of B-cells, but the precise mechanisms of alterations of their activity in B-cell malignancies are generally unknown.,, The global histone modification profile is well conserved between B-cell lymphomas and their normal counterparts. Given the importance of epigenetic patterning in determining cellular phenotypes, it is necessary to address the epigenetic control of GC B-cells and related malignancies. The DNA methyltransferase (DNMT) family, which includes DNMT1, DNMT3a, and DNMT3b, comprises enzymes that catalyze the formation of 5-methylcytosine (5-mC) in mammalian genomic DNA. Both DNMT3a and DNMT3b function as tumor suppressors during malignant lymphopoiesis. Ten-eleven-translocation (TET) 2 catalyzes the conversion of 5-mC to 5-hydroxymethylcytosine (5-hmC), which leads to active DNA demethylation. Loss-of-function mutations in the TET2 gene have been described in human hematological malignancies. Recently, we demonstrated that decreased TET2 expression and increased 5-hmC levels are characteristics of myeloid sarcomas. Moreover, DNMT3a mutations and TET2 inactivation cooperate in the deregulation of DNA methylation in the control of lymphoid malignancies in mice. Aberrant DNA hypermethylation and hypomethylation have been clearly shown to occur in lymphomas derived from GC B-cells on the basis that DNMT1 and DNA methylation patterning contribute to GC B-cell differentiation. DNA methylation patterning is more heterogeneous in GC B-cells than in non-B-cells, and the variation in DNA methylation patterns in GC B-cells may be a consequence of their biological and phenotypic heterogeneity. Although the function of cytosine methylation in mature B-cell gene expression patterning implies a contribution of activation-induced cytosine deaminase to genetic and epigenetic instability during lymphomagenesis, other demethylation mechanisms are likely to exist in GC B-cells. The SWI/SNF (mating type switching/sucrose nonfermenting) complex is an evolutionarily conserved multiunit complex of factors that utilize energy from ATP hydrolysis to remodel nucleosomes and thereby affect gene expression. Very little is known regarding the mechanisms of chromatin remodeling in GC B-cells and related malignancies. LSH, a protein belonging to the SNF2 family of chromatin-remodeling ATPases, establishes correct DNA methylation levels and patterns and is critical for normal development.,,, LSH maintains genome stability in mammalian somatic cells. LSH serves as a target for DeltaNp63alpha in driving skin tumorigenesis in vivo and cooperates with the oncogenic function of E2F3., Recently, we found that LSH is a driver of cancer progression., Meanwhile, based on the bioinformatic finding that the promoter of LSH contains an E2F1 binding site, we observed that E2F1 upregulates LSH expression in glioma through the LRP6/GSK3beta axis., However, the significance and potential mechanism of LSH in GC and B-cell malignancies remain poorly described. 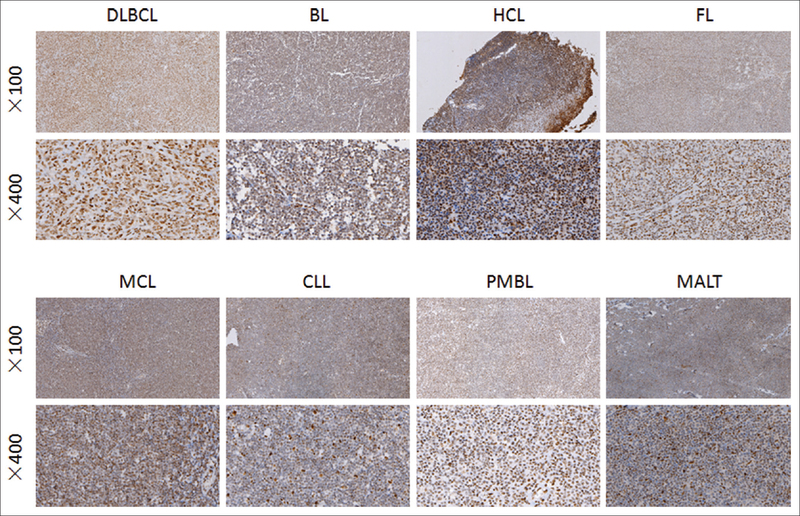 This study investigated 181 paraffin-embedded lymphoma samples using immunohistochemistry (IHC) and in situ hybridization. The following outcomes were assessed: (1) the frequency of epigenetic lesions, including LSH and E2F1, and (2) the possible correlations among molecular findings, phenotype, clinical features and outcome. Approval to review, analyze, and publish the data in this study was given by the Ethics Board of Xiangya Hospital of Central South University. Informed consent was obtained from all patients or their relatives, and the Institutional Ethics Committee of our hospital approved the study. All data were retrieved from the files of the Xiangya Pathologic Anatomy Service. There were 181 consecutive patients with newly diagnosed lymphoma malignancies at Xiangya Hospital of Central South University between 2011 and 2015, including 29 patients with diffuse large B-cell lymphoma (DLBCL), 22 with Burkitt lymphoma (BL), 6 with hairy cell lymphoma (HCL), 29 with follicular lymphoma (FL), 29 with mantle cell lymphoma (MCL), 24 with chronic lymphocytic leukemia/small lymphocytic lymphoma (CLL/SLL), 17 with primary mediastinal B-cell lymphoma (PMBL) and 25 with mucosal-associated lymphoid tissue (MALT) lymphoma. All specimens were fixed in 10% neutral formalin, entrapped through conventional paraffin embedding, and processed into 4 μm serial sections with conventional H and E staining. 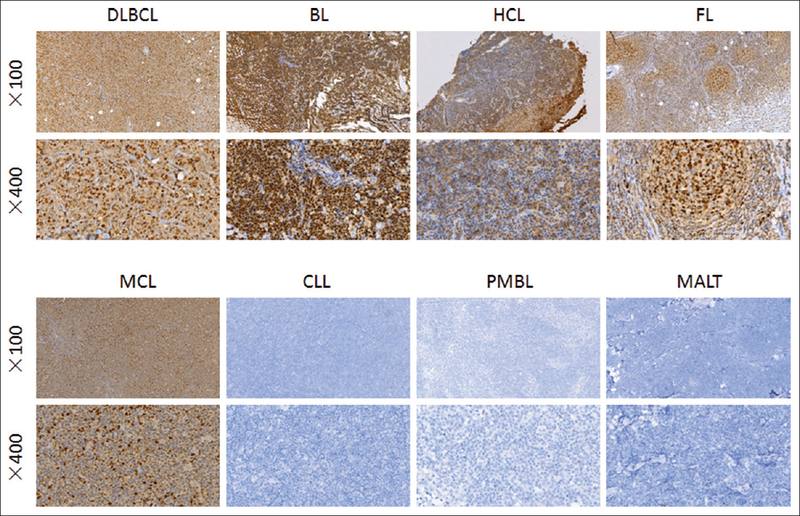 The S-P immunohistochemical method was employed to identify immune phenotypes. Antibodies against LCA (2B11, DAKO), CD3 (F7.2.38, DAKO), CD45RO (OPD4, DAKO), CD20 (L26, DAKO), CD10 (MX002, DAKO), CD15 (Carb-3, DAKO), CD30 (Ber-2, DAKO), Bcl-2 (SP66, DAKO), Bcl-6 (LN22, DAKO), CyclinD-1 (DCS-6, DAKO), PAX-5 (SP34, DAKO), LSH (sc-46665, Santa Cruz), E2F1 (KH95, Santa Cruz), Ki67 (M7240, DAKO) and 5-hmC (39769, Active Motif) were used. Details of the immunohistochemical techniques used in this study have been previously described. Three experienced pathologists assessed the percentage of neoplastic-positive cells. Definitive results were obtained by semi-quantitative classification using 10 or more visual fields (×200). The slides were first scored as follows: 0 (negative), 1 (buff), 2 (pale brown), and 3 (tan). 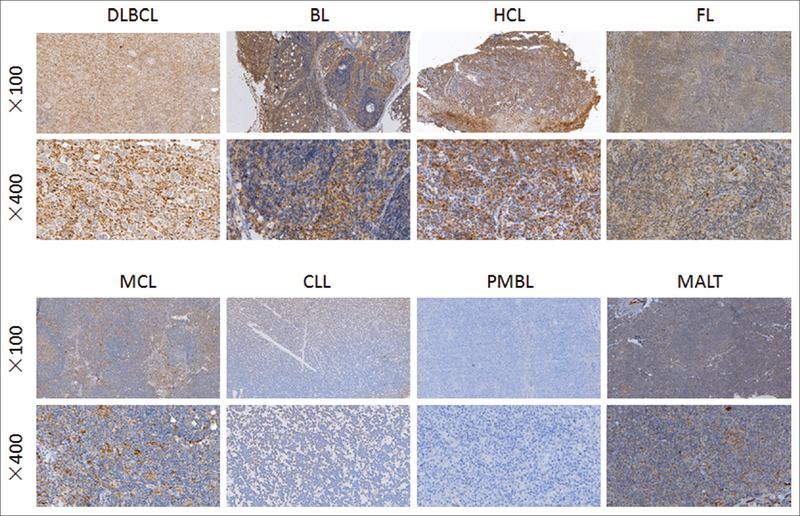 Positive expression was scored as 0 (negative), 1 (<10% positively staining tumor cells), 2 (11%–50% positively staining tumor cells), 3 (50%–75% positively staining tumor cells), and 4 (>75% positively staining tumor cells). The two scores were multiplied to determine the final result, and a score greater than four was considered positive. Two serial sections (4 μm) of the specimens (one for in situ hybridization and one for use as a negative control) were loaded onto an aminopropyltriethoxysilane-treated glass slide. Next, the samples were processed by routine paraffin removal, hydration, proteinase K digestion, and dehydration with gradient ethanol. Epstein-Barr virus (EBV)-encoded RNA (EBER) HRP-conjugated probe (15–20 μl) was added; then, the samples were hybridized at 37°C for 2 h, incubated with 1% anti-FITC/AP, colored with 2% BCIP/NBT, counterstained with 1% methyl green, and mounted with neutral balsam. The selected 181 cases with B-cell lymphomas were reclassified by three pathologists using the expression profiles of different immune phenotypes, morphological analysis, and the classification standards of lymphatic and hematopoietic system tumors formulated by the WHO in 2015. The classification results showed that there were 29 DLBCLs, 22 BLs, 6 HCLs, 29 FLs, 29 MCLs, 24 CLLs/SLLs, 17 PMBLs, and 25 MALT lymphomas. These results are consistent with the previous diagnoses. 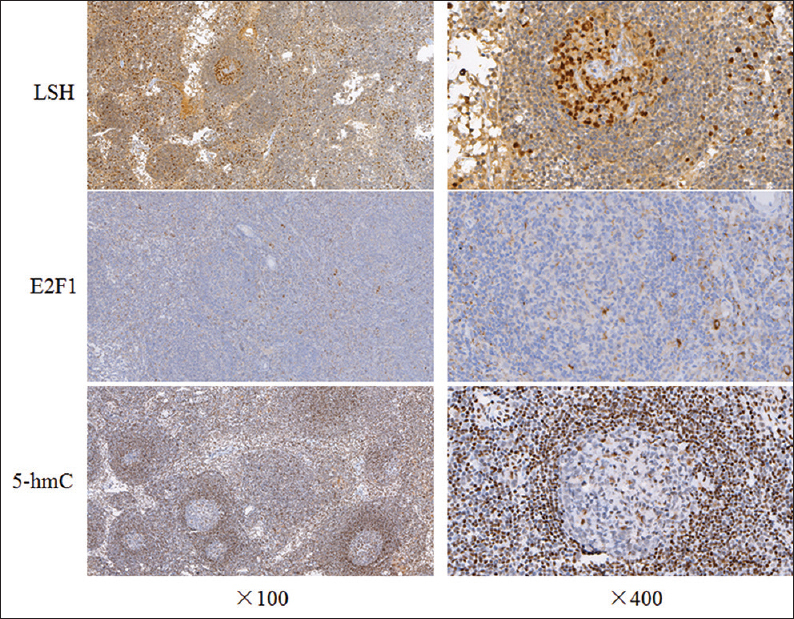 We analyzed LSH and E2F1 expression in patients with B-cell malignancies through an immunohistochemical study. With approval from our Institutional Review Board and written patient consent, we first detected the level of LSH, 5-hmC, and E2F1 in the lymph nodes [Figure 1]. Next, we analyzed Ki67, a cellular marker for proliferation and observed that it increased gradually in B-cell lymphoma [Figure 2]. We also detected LSH, 5-hmC, and E2F1 in B-cell malignancies, as indicated [Figure 3], [Figure 4], [Figure 5]. Quantitative analysis indicated a significant increase in expression in these B-cell malignancies [Figure 6] and [Table 1]. We detected high levels of LSH in GC B-cells, particularly in the dark zone (centroblasts), and a gradual decrease of expression in the light zone [centrocytes; [Figure 1]. 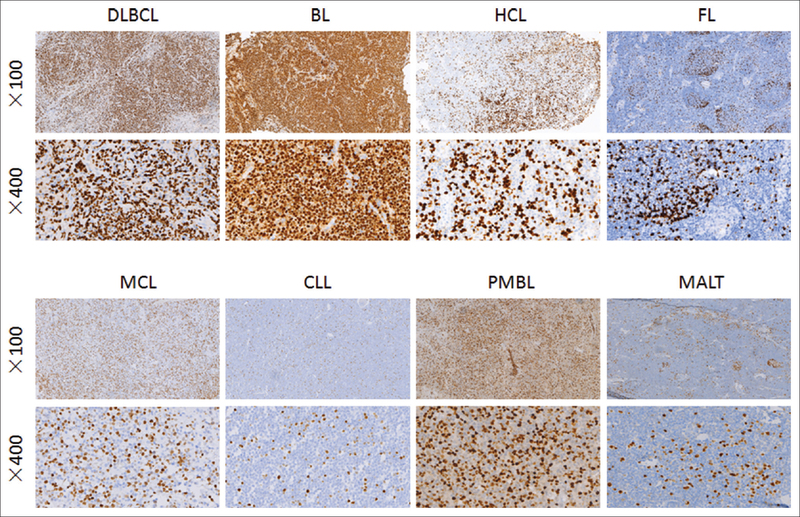 Specifically, moderate-to-strong nuclear staining of the LSH protein was evident in cells, as well as tumor cells, from FL, MCL, DLBCL, and BL, whereas LSH was decreased in CLL, PMBL, and MALT [Figure 3]. Nearly complete positive expression of LSH was observed in lymph nodes, and the expression increased in all B-cell malignancies [Table 1]; in situ hybridization further confirmed LSH expression at the mRNA level (data not are shown). We analyzed 5-hmC staining in lymph nodes and B-cell lymphomas. Interestingly, nuclear staining of 5-hmC was observed around the GC in lymph nodes, and 5-hmC staining increased in tumor cells from DLBCL and BLs [Figure 4], indicating a strong correlation between LSH and 5-hmC. Furthermore, we measured E2F1 levels to determine if E2F1 functions as a transcription activator in B-cell malignancies. 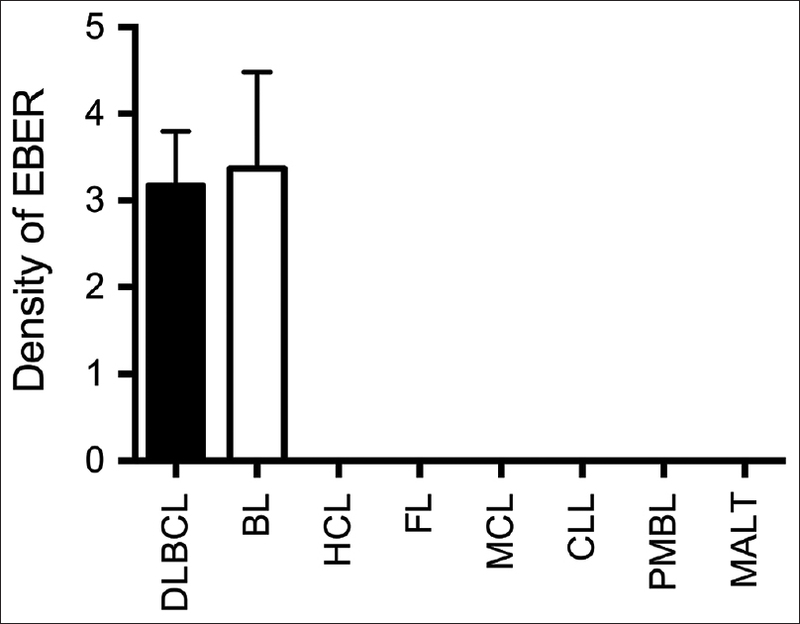 We found that E2F1 increased mainly in DLBCL and BL [Figure 5] and [Table 1]. Quantitative IHC analysis revealed that the density of E2F1 was increased in B-cell malignancies compared to that in normal lymph nodes; in situ hybridization further confirmed E2F1 expression at the mRNA level (data not shown). EBV is associated with dysregulation of germinal center B-cells and several types of lymphoid neoplasms including BLs. Using in situ hybridization, we found that the staining of EBER, a marker of EBV infection, indicated infection rates of 62.5% and 36.8% in DLBCLs and BLs, respectively, and LSH was also increased compared with other B-cell malignancies [Figure 7] and [Figure 8]. We previously found that EBV promotes LSH expression in nasopharyngeal carcinoma,, and our findings further indicate that viral infection may be involved in B-cell malignancies, especially in germinal center lymphomas including DLBCL and BL. Until recently, there were few studies implicating LSH, 5-hmC and E2F1 in hematological malignancies. In the present study, we described the levels of LSH, 5-hmC and E2F1 from biopsies of several B-cell hematological malignancies, especially those originating from germinal centers. Our findings suggest a potential role for LSH, 5-hmC, and E2F1 as biomarkers and therapeutic targets for germinal center lymphomas. More detailed molecular descriptions of the function and localization of LSH, 5-hmC, and E2F1 will aid in clarifying their roles. Nevertheless, the ability of LSH, 5-hmC, and E2F1 to predict tumorigenesis and prognosis in germinal center lymphomas remains an area for further examination. We would like to thank all laboratory members for their critical discussion of this manuscript. This work was financially supported by the National Basic Research Program of China [2015CB553903 (Y.T. )], and the National Nature Foundation of China [81772927 (D.X.)]. De Silva NS, Klein U. Dynamics of B cells in germinal centres. Nat Rev Immunol 2015;15:137-48. Xu Y, Zhou X, Li Y, Zhang Y, Wang X. Expression and clinical significance of centrosomal protein 55 in T-cell lymphoma. J Cancer Res Ther 2018;14:94-8. Hatzi K, Melnick A. Breaking bad in the germinal center: How deregulation of BCL6 contributes to lymphomagenesis. Trends Mol Med 2014;20:343-52. Shaffer AL 3rd, Young RM, Staudt LM. Pathogenesis of human B cell lymphomas. Annu Rev Immunol 2012;30:565-610. Koues OI, Kowalewski RA, Chang LW, Pyfrom SC, Schmidt JA, Luo H, et al. Enhancer sequence variants and transcription-factor deregulation synergize to construct pathogenic regulatory circuits in B-cell lymphoma. Immunity 2015;42:186-98. Koues OI, Oltz EM, Payton JE. Short-circuiting gene regulatory networks: Origins of B cell lymphoma. Trends Genet 2015;31:720-31. Kulis M, Merkel A, Heath S, Queirós AC, Schuyler RP, Castellano G, et al. Whole-genome fingerprint of the DNA methylome during human B cell differentiation. Nat Genet 2015;47:746-56. Matsuda I, Imai Y, Hirota S. Global histone modification profiles are well conserved between normal B lymphocytes and neoplastic counterparts. Pathol Oncol Res 2010;16:447-51. Peters SL, Hlady RA, Opavska J, Klinkebiel D, Pirruccello SJ, Talmon GA, et al. Tumor suppressor functions of dnmt3a and Dnmt3b in the prevention of malignant mouse lymphopoiesis. Leukemia 2014;28:1138-42. Delhommeau F, Dupont S, Della Valle V, James C, Trannoy S, Massé A, et al. Mutation in TET2 in myeloid cancers. N Engl J Med 2009;360:2289-301. Xiao D, Shi Y, Fu C, Jia J, Pan Y, Jiang Y, et al. Decrease of TET2 expression and increase of 5-hmC levels in myeloid sarcomas. Leuk Res 2016;42:75-9. Scourzic L, Couronné L, Pedersen MT, Della Valle V, Diop M, Mylonas E, et al. DNMT3A(R882H) mutant and Tet2 inactivation cooperate in the deregulation of DNA methylation control to induce lymphoid malignancies in mice. Leukemia 2016;30:1388-98. Shaknovich R, Cerchietti L, Tsikitas L, Kormaksson M, De S, Figueroa ME, et al. DNA methyltransferase 1 and DNA methylation patterning contribute to germinal center B-cell differentiation. Blood 2011;118:3559-69. Dominguez PM, Teater M, Chambwe N, Kormaksson M, Redmond D, Ishii J, et al. DNA methylation dynamics of germinal center B cells are mediated by AID. Cell Rep 2015;12:2086-98. Wilson BG, Roberts CW. SWI/SNF nucleosome remodellers and cancer. Nat Rev Cancer 2011;11:481-92. Myant K, Termanis A, Sundaram AY, Boe T, Li C, Merusi C, et al. LSH and G9a/GLP complex are required for developmentally programmed DNA methylation. Genome Res 2011;21:83-94. Tao Y, Xi S, Shan J, Maunakea A, Che A, Briones V, et al. Lsh, chromatin remodeling family member, modulates genome-wide cytosine methylation patterns at nonrepeat sequences. Proc Natl Acad Sci U S A 2011;108:5626-31. Yu W, McIntosh C, Lister R, Zhu I, Han Y, Ren J, et al. Genome-wide DNA methylation patterns in LSH mutant reveals de-repression of repeat elements and redundant epigenetic silencing pathways. Genome Res 2014;24:1613-23. Zemach A, Kim MY, Hsieh PH, Coleman-Derr D, Eshed-Williams L, Thao K, et al. The arabidopsis nucleosome remodeler DDM1 allows DNA methyltransferases to access H1-containing heterochromatin. Cell 2013;153:193-205. Burrage J, Termanis A, Geissner A, Myant K, Gordon K, Stancheva I. The SNF2 family ATPase LSH promotes phosphorylation of H2AX and efficient repair of DNA double-strand breaks in mammalian cells. J Cell Sci 2012;125:5524-34. Keyes WM, Pecoraro M, Aranda V, Vernersson-Lindahl E, Li W, Vogel H, et al. ΔNp63α is an oncogene that targets chromatin remodeler lsh to drive skin stem cell proliferation and tumorigenesis. Cell Stem Cell 2011;8:164-76.
von Eyss B, Maaskola J, Memczak S, Möllmann K, Schuetz A, Loddenkemper C, et al. The SNF2-like helicase HELLS mediates E2F3-dependent transcription and cellular transformation. EMBO J 2012;31:972-85. Wang R, Shi Y, Chen L, Jiang Y, Mao C, Yan B, et al. The ratio of foxA1 to foxA2 in lung adenocarcinoma is regulated by lncRNA HOTAIR and chromatin remodeling factor LSH. Sci Rep 2015;5:17826. Liu S, Tao YG. 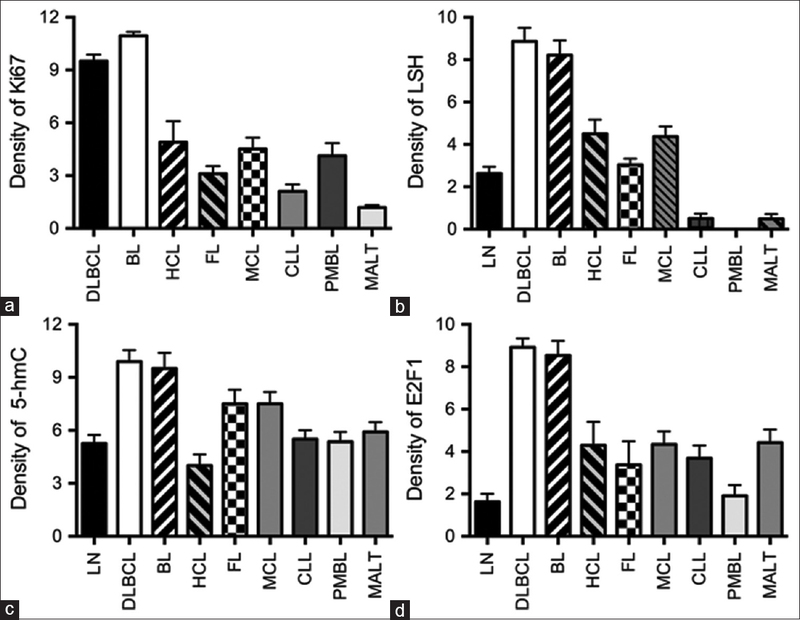 Chromatin remodeling factor LSH affects fumarate hydratase as a cancer driver. Chin J Cancer 2016;35:72. Xiao D, Huang J, Pan Y, Li H, Fu C, Mao C, et al. Chromatin remodeling factor LSH is upregulated by the LRP6-GSK3β-E2F1 axis linking reversely with survival in gliomas. Theranostics 2017;7:132-43. Wu H, Li W, Zhang M, Zhu S, Zhang D, Wang X, et al. Inhibitory roles of miR-320 in osteosarcoma via regulating E2F1. J Cancer Res Ther 2016;12:68-71. Xiao D, Jia J, Shi Y, Fu C, Chen L, Jiang Y, et al. Opposed expression of IKKα: Loss in keratinizing carcinomas and gain in non-keratinizing carcinomas. Oncotarget 2015;6:25499-505. Khan H, Gupta S, Husain N, Misra S, Singh N, Negi MP, et al. Prognostics of cyclin-D1 expression with chemoradiation response in patients of locally advanced oral squamous cell carcinoma. J Cancer Res Ther 2014;10:258-64. He X, Yan B, Liu S, Jia J, Lai W, Xin X, et al. Chromatin remodeling factor LSH drives cancer progression by suppressing the activity of fumarate hydratase. Cancer Res 2016;76:5743-55. He Q, Zhou Y, Fu C, Zhu W, Zhou J, Liu S, et al. Lymphoepithelioma is a nonkeratinizing squamous cell carcinoma with Epstein-Barr virus infection in China. J Cancer Res Ther 2017;13:807-12.